I have tested two high-performance solutions from - LG 49SK8000PUA vs 49UJ6300. 49SK8000PUA belongs to the SK800 series and 49UJ6300 is from the UJ630 series. 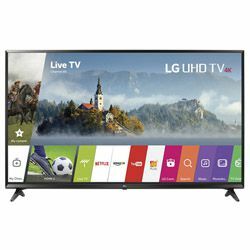 These series also include other modern TVs with many functions. 49SK8000PUA is a 2018 year model and 49UJ6300 was released in 2017. 49SK8000PUA belongs to the mid-high price range, since it costs more than $500, while 49UJ6300 belongs to the mid-low price range and it may cost you less than $400. These models have some common features – IPS displays, but 49SK8000PUA uses the Ede LED backlight technology and 49UJ6300 uses the Direct LED technology. 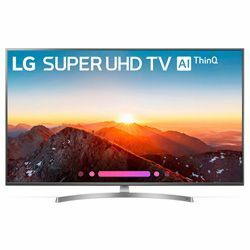 These TVs support the modern 4K standard. If we compare LG 49UJ6300 vs 49SK8000PUA in terms of the motion processing technologies, we will see that 49SK8000PUA uses TruMotion 240 and 49UJ6300 uses TruMotion 120. Nevertheless, you will not get any motion blurring. Both models have Active HDR, but 49SK8000PUA also has local dimming. It uses the Nano Cell Display technology to make colors more vivid and the ThinQ technology to deliver a cinematic experience. Both models use WebOS (4.0 - 49SK8000PUA and 3.5 - 49UJ6300). Both TVs have powerful processors installed which allow decreasing the response time. 49UJ6300 uses the Sling TV feature which lets you personalize the channel lineup, but 49SK8000PUA is compatible with Google Assistant and Alexa. It also supports the Dolby Atmos technology. These two models look modern, they are slim. 49SK8000PUA has the stable arch-shaped stand and 49UJ6300 has the Y-shaped stand. However, you can wall-mount these TVs. The bezels are quite narrow and 49SK8000PUA has a brushed texture. The dimensions are 43.4x28.2x9.79 in for 49SK8000PUA versus 43.7x27.79x9.29 in for 49UJ6300 (with the stand that is 2-3 in high). Both models can be controlled via a remote controller. Easy to set up and install – the menus are user-friendly and there are many parameters to adjust. The image quality is very high – it is clear, colors are vibrant. No motion blurring. The remote controller is ergonomic and it has all the buttons you need. Some customers have troubles with the Wi-Fi module – the connection is not stable. WebOS has everything you need – many applications and a “full” web browser. The picture quality is stunning – the colors are vivid (the black color is very dark) and the image is clear. Many parameters to adjust make it flexible. Some customers find the remote controller too small. You may experience an unstable Wi-Fi connection. TruMotion does not handle motion well.